Geometric progression: What is a geometric progression? Recursive vs. explicit formula for geometric sequence. How to use the geometric sequence calculator? Calculate anything and everything about a geometric progression with our geometric sequence calculator. 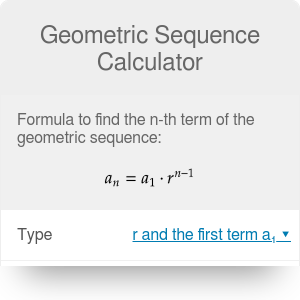 This geometric series calculator will help you understand the geometric sequence definition so you could answer the question what is a geometric sequence? We explain the difference between both geometric sequence equations, the explicit and recursive formula for a geometric sequence, and how to use the geometric sequence formula with some interesting geometric sequence examples. We also have built a "geometric series calculator" function that will evaluate the sum of a geometric sequence starting from the explicit formula for a geometric sequence and building, step by step, towards the geometric series formula. The geometric sequence definition is that a collection of numbers, in which all but the first one, are obtained by multiplying the previous one by a fixed, non-zero number called the common ratio. If you are struggling to understand what a geometric sequences is, don't fret! We will explain what this means in more simple terms later on and take a look at the recursive and explicit formula for a geometric sequence. We also include a couple of geometric sequence examples. Before we dissect the definition properly, it's important to clarify a few things to avoid confusion. First of all, we need to understand that even though the geometric progression is made up by constantly multiplying numbers by a factor, this is not related to the factorial. Indeed, what it is related to is the Greatest Common Factor (GFC) and Lowest Common Multiplier (LCM) since all the numbers share a GCF or a LCM if the first number is an integer. This means that the GCF is simply the smallest number in the sequence. Conversely, the LCM is just the biggest of the numbers in the sequence. For example in the sequence 3, 6, 12, 24, 48 the GCF is 3 and the LCM would be 48. But if we consider only the numbers 6, 12, 24 the GCF would be 6 and the LCM would be 24. Now let's see what is a geometric sequence in layperson terms. A geometric sequence is a collection of specific numbers that are related by the common ratio we have mentioned before. 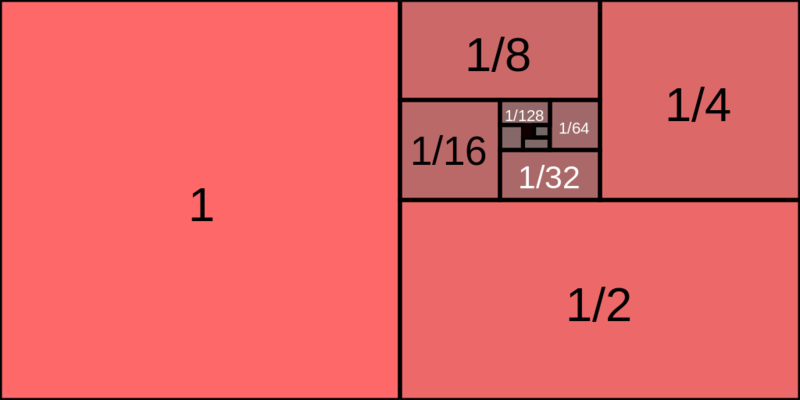 The ratio is one of the defining features of a given sequence, together with the initial term of a sequence. We will see later how these two numbers are at the basis of the geometric sequence definition and depending on how they are used, one can obtain the explicit formula for a geometric sequence or the equivalent recursive formula for the geometric sequence. where n is the position of said term in the sequence. However, there are more mathematical ways to provide the same information. These other ways are the so-called explicit and recursive formula for geometric sequences. Now that we understand what is a geometric sequence, we can dive deeper into this formula and explore ways of conveying the same information in fewer words and with greater precision. where n ∈ 𝗡 means that n =1, 2, 3, .... The recursive formula for geometric sequences conveys the most important information about a geometric progression: the initial term a₁, how to obtain any term from the first one, and the fact that there is no term before the initial. Where x is used to express the fact that any number will be used in its place, but also that it must be an explicit number and not a formula. The subscript i indicates any natural number (just like n) but it's used instead of n to make it clear that i doesn't need to be the same number as n.
Infinite sum: Sum of all terms possible from n=1 to n=∞. These terms in the geometric sequence calculator are all known to us already, except the last 2, about which we will talk in the following sections. If you ignore the summation components of the geometric sequence calculator, you only need to introduce any 3 of the 4 values to obtain the 4th element. The sums are automatically calculated from this values; but seriously, don't worry about it too much, we will explain what they mean and how to use them in the next sections. So far we have talked about geometric sequences or geometric progressions, which are collections of numbers. However, there are really interesting results to be obtained when you try to sum the terms of a geometric sequence. When we have a finite geometric progression, which has a limited number of terms, the process here is as simple as finding the sum of a linear number sequence. Calculating the sum of this geometric sequence can even be done by hand, in principle. Where m is the total number of terms we want to sum. This result is one you can easily compute on your own, and it represents the basic geometric series formula when the number of terms in the series is finite. However, this is maths and not the Real Life™ so we can actually have an infinite number of terms in our geometric series and still be able to calculate the total sum of all the terms. How does this wizardry work? - I hear you ask. Well, fear not, we shall explain all the details to you, young apprentice. After seeing how to obtain the geometric series formula for a finite number of terms, it is natural (at least for mathematicians) to ask how can I compute the infinite sum of a geometric sequence? It might seem impossible to do so, but certain tricks allow us to calculate this value in a few simple steps. For this, we need to introduce the concept of limit. This is a mathematical process by which we can understand what happens at infinity. It can also be used to try to define mathematically expressions that are usually undefined, such as zero divided by zero or zero to the power of zero. Talking about limits is a very complex subject and it goes beyond the scope of this calculator. Their complexity is the reason that we have decided to just mention them, and to not go into detail about how to calculate them. Do not worry, though, because you can find very good information on the Wikipedia article about limits. Even if you can't be bothered to check what limits are you can still calculate the infinite sum of a geometric series using our calculator. The only thing you need to know is that not every series have a defined sum. The conditions that a series has to fulfill for its sum to be a number (this is what mathematicians call convergence), are, in principle, simple. We explain them in the following section. When it comes to mathematical series (both geometric and arithmetic sequences), they are often grouped in two different categories depending on whether their infinite sum is finite (convergent series) or infinite / non-defined (divergent series). The best way to know if a series is convergent or not is to calculate their infinite sum using limits. Short of that, there are some tricks that can allow us to rapidly distinguish between convergent and divergent series without having to do all the calculations. These tricks include: looking at the initial and general term, looking at the ratio or comparing with other series. For a series to be convergent, the general term (aₙ) has to get smaller for each increase in the value of n. If aₙ gets smaller, we cannot guarantee that the series will be convergent, but if aₙ is constant or gets bigger as we increase n we can definitely say that the series will be divergent. If we are not sure whether aₙ gets smaller or not, we can simply look at the initial term and the ratio, or even calculate some of the first terms. This will give us a sense of how aₙ evolves. The second option we have is to compare the evolution of our geometric progression against one that we know for sure converges (or diverges), which can be done with a quick search online. Speaking broadly, if the series we are investigating is smaller (i.e. : aₙ is smaller) than one that we know for sure that converges, we can be certain that our series will also converge. Conversely, if our series is bigger than one we know for sure is divergent, our series will always diverge. In the rest of the cases (bigger than a convergent or smaller than a divergent) we cannot say anything about our geometric series and we are forced to find another series to compare to or to use another method. We have already seen a geometric sequence example in the form of the so-called Sequence of powers of two. This is a very important sequence because of computers and their binary representation of data. 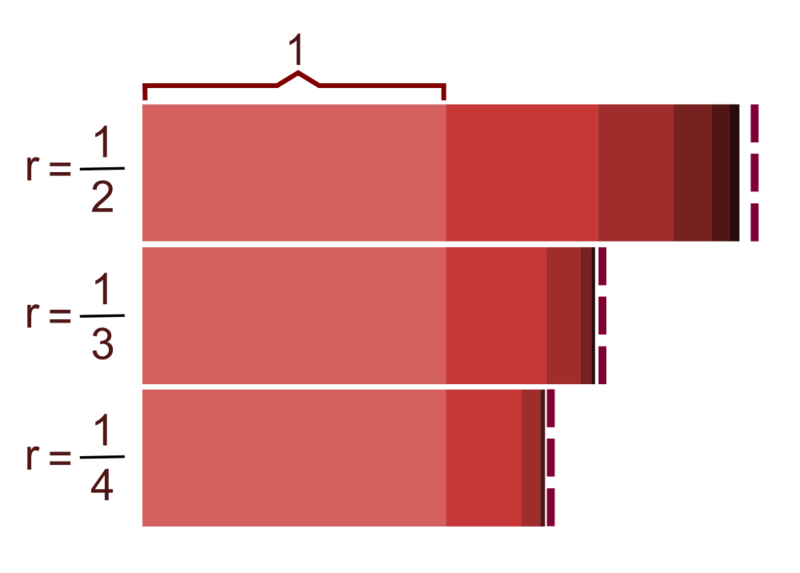 In this progression we can find values such as the maximum allowed number in a computer (varies depending on the type of variable we use), the numbers of bytes in a gigabyte, or the number of seconds till the end of UNIX time (both original and patched values). On top of the power-of-two sequence, we can have any other power sequence if we simply replace r = 2 with the value of the base we are interested in. Power series are commonly used and widely known and can be expressed using the convenient geometric sequence formula. But this power sequences of any kind are not the only sequences we can have, and we will show you even more important or interesting geometric progressions like the alternating series or the mind-blowing Zeno's paradox. Let's start with Zeno's paradoxes, in particular, the so-called Dichotomy paradox. This paradox is at its core just a mathematical puzzle in the form of an infinite geometric series. Zeno was a Greek philosopher the pre-dated Socrates. He devised a mechanism by which he could prove that movement was impossible and should never happen in real life. The idea is to divide the distance between the starting point (A) and the finishing point (B) in half. Once you have covered the first half you divide the remaining distance half again... You can repeat this process as many times as you want which means that you will always have some distance left to get to point B.
Zeno's paradox seems to predict that, since we have an infinite amount of halves to walk, we would need an infinite amount of time to travel from A to B. However, as we know from our everyday experience this is not true and we can always get to point A to point B in a finite amount of time (except for Spanish people that always seem to arrive infinitely late everywhere). The solution to this apparent paradox can be found using maths. Which is the mathematical proof that we can get from A to B in a finite amount of time (t in this case). Now you can go and show-off to your friends, as long as they are not mathematicians. Geometric Sequence Calculator can be embedded on your website to enrich the content you wrote and make it easier for your visitors to understand your message.